Abstract. The global carbon cycle is an important component of the Earth system and it interacts with the hydrology, energy and nutrient cycles as well as ecosystem dynamics. A better understanding of the global carbon cycle is required for improved projections of climate change including corresponding changes in water and food resources and for the verification of measures to reduce anthropogenic greenhouse gas emissions. An improved understanding of the carbon cycle can be achieved by data assimilation systems, which integrate observations relevant to the carbon cycle into coupled carbon, water, energy and nutrient models. Hence, the ingredients for such systems are a carbon cycle model, an algorithm for the assimilation and systematic and well error-characterised observations relevant to the carbon cycle. Relevant observations for assimilation include various in situ measurements in the atmosphere (e.g. concentrations of CO2 and other gases) and on land (e.g. 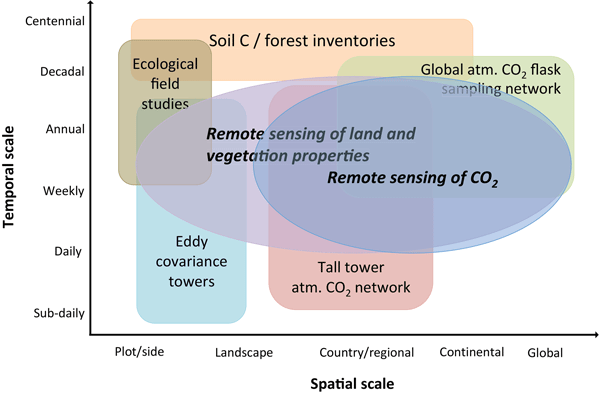 fluxes of carbon water and energy, carbon stocks) as well as remote sensing observations (e.g. atmospheric composition, vegetation and surface properties). 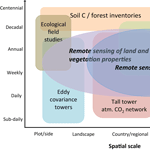 How to cite: Scholze, M., Buchwitz, M., Dorigo, W., Guanter, L., and Quegan, S.: Reviews and syntheses: Systematic Earth observations for use in terrestrial carbon cycle data assimilation systems, Biogeosciences, 14, 3401-3429, https://doi.org/10.5194/bg-14-3401-2017, 2017.